The High Bridge, just prior to completion. With no less than four different bridge repair and reconstruction projects underway this year, the summer of 2015 was quite a time for Eau Claire – a.k.a. the “City of Bridges.” However, one bridge in particular stands tallest amongst its spantastic brethren. You can’t deny it – the recently revamped and reopened High Bridge has got some serious juice. 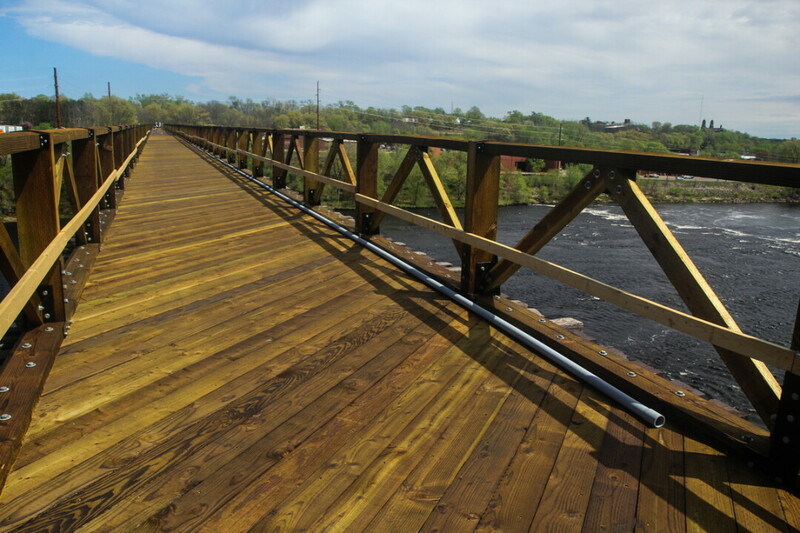 The ol’ railroad bridge anchored into the Chippewa River north of Madison Street was converted into a bike and pedestrian crossing just in time for summer strollin’ season, offering us some of the very best vistas in town. Off one side, we see the Mighty Chip’ a-flowin’ into downtown Eau Claire. From the other side we see the river bending gently into the Xcel Energy dam. The sheer height of the bridge generates the fantastic view and the local buzz. But! Is the High Bridge our highest bridge? Perhaps not. According to city engineer Dave Solberg, the Hastings Way bridges over the Eau Claire River could be as much as 10 feet higher. So let us ask this: Which bridge is highest in our hearts? For 2015, the clear winner is the High Bridge. Most recently, the city opened a new trail connection, making the bridge part of glorious pathway leading from the west side of town right through the heart of the city.